Successfully Added Outdoor IP Camera with Sony CCD (Motion Detection, Night Vision) to your Shopping Cart. New Weatherproof Outdoor IP Camera with 1/3 Inch Sony CCD and Night Vision + Motion Detection. Are you worried about the security of your house and your valuable assets when you are away from home? You want to know what is happening around your property when sitting 10,000 miles away from it? Get help with the latest in surveillance technology, a weatherproof IP camera with night vision and motion detection ability to protect your home, business and your loved ones. Why IP camera? Because only an IP camera can hold an IP address, which is equivalent to a street address on the Internet, so you will be able to find and gain access to its video surveillance via internet from anywhere in the world. Whether you are just out having lunch at mcDonalds or flying half way around the world to attend a business meeting, you will always be able to access this camera to instantly see who is climbing into your backyard or which of your employees has been lazy. This Outdoor IP Camera with Sony CCD is constructed with a weatherproof heavy-duty die-cast aluminum casing to protect from wind, dust, rain and snow. It includes a high quality 1/3 Inch Sony CCD sensor provides an amazing 540 TV lines of resolution at 25 frames per second (FPS) for super clear images in all conditions. And when the sun is set and darkness arrives, its sensor will detect a reduction in the amount of light and will automatically switch on its massive array of 42 IR LED's to provide nighttime illumination of up to 70 meters. Even if you are in a place with no internet, no need to worry, because this Outdoor IP Camera with Sony CCD will keep you informed with timed video recording and motion detection. Maybe you think one camera is not enough? Buy several and set them up to watch every little corner around your house, and create a security zone that you can monitor from the comfort of your computer. How can such a powerful Outdoor IP Camera with Sony CCD cost less than a couple of video games? Because we are selling it to you at a low China Wholesale price! So if you want 2010 to be the year that you have 24 hour a day, 365 days a year, always live video surveillance of your home or business, then this is the product you need! Don't delay, click "Add to Cart" right now and we will express ship you one tomorrow! SONY CCD for the best IP Camera image you have ever seen! - Video file size: around 5 MB per minute. Both I45 and I44 will work under the same software system. So you can mix and match your selection of cameras and control all of them with single software system. I45 has a slightly shorter viewing range. Fun uses include watching the neighbor sunbathe on the weekends. To help transfer images with good speed and quality, captured video is compress in H.264/MPEG4 standard to save bandwidth and minimise lose of detail. The device is not wireless/cordless, you will need to connect cables from the camera to the computer. 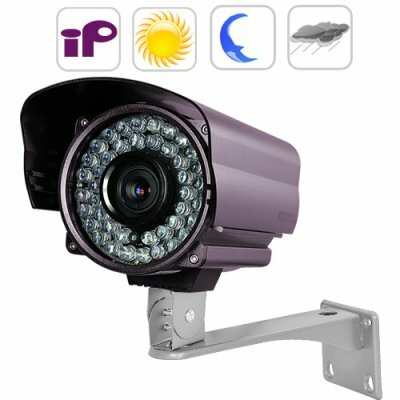 Here is a brief instruction on how to setup your I44 Outdoor IP Camera to the same LAN as your computer. If you have problem, please seek computer professionals for help. - Install software from the CD to your computer. Disconnect your computer from LAN. - Double click on it and change its IP address to either dynamic IP address or to a fix IP address that is part of your LAN. For example, if the original IP address of your computer in LAN is 192.168.0.1, you can change the IP address of IP camera to 192.168.0. *, where * is any number that has not been used. - Disconnect the IP camera from your computer, re-connect it to your LAN and change the IP address of your computer back to the original IP address. - Open the "Server Tools" program, you should now be albe to see the IP camera as part of your LAN. You can use "admin" for the Username/password or just leave it blank. Hi, the instruction manual that came with the I44 Outdoor IP Camera does not seem to match the product. Can I get another manual? This product is designed to be used by experienced surveillance camera users. If you need a beginners model IP Camera with a detailed instruction manual we suggest you order model CVLM-I33. Can this camera upload videos with motion detection function? No, it can only upload pictures.